Heavy duty 2-inch wide adjustable leather cuffs with two separate locks and D-rings. 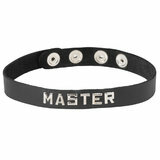 The Spartacus Leather Locking Cuffs are attached by a pair of studs in the middle. Made from American oil-tan leather. Two keys for each cuff. Built to last!